It’s not that I miss the 50-mile drive from Gainesville to Cedar Key to have a bowl of Tony’s Award-Winning Clam Chowder, but that’s not something I want to do on a weekly basis. After all, Cedar Key’s a great little coastal town, with some darn good fishing and some nice little shops to visit. And some fabulous clam chowder! Sounds so yummy, glad I stumbled across this! I’m such a fan of Florida, and Florida cuisine! When I travel though, I spend most of my time in Palm Bay, where my parents retired. Great city, any way I can pick this soup up there?! If you’re ever in the area, you have to check out this great hotel my parents put me on to- the Palm Bay Hotel (www.palmbay-hotel.com). Inexpensive and the way to go when traveling in the area. 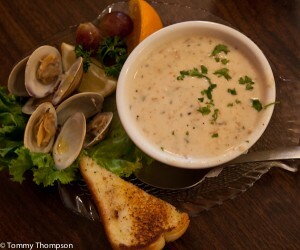 We purchased a can of clam chowder at your restaurant in Cedar Key and wanted to tell you that it was just as delicious as it was from Tony’s. Thanks again for a repeat of good eating! Looks like it is sold at Publix for $3.79 for a 15 oz can of condensed which will make a quart. Great soup. I bought a big can at the restaurant, but haven’t fixed it yet. I wanted to fix it when we had company but my husband did not want to share it; Makes three quarts so he’s gonna’ have to share it with someone!! It is very good. Eileen….Publix should be adding Tony’s to the their statewide inventories soon, but in the meantime, contact Kellie Parkin at Tony’s (kellie@tonyschowder.com). She may have specific information. Tony’s World Champion Clam Chowder, Inc.
Vanesa…many Publix Supermarkets have it.